6 Feb 2019 Results of my FTDNA Y-DNA37 test Kit No. 892549 - I have 11 matches to the "Eaton" surname, thus I am not a Young as born, nor Begnal as my Father was born. "The Internet bringing Friends, Family and the World Together"
Volunteers are the most precious research tool, show your appreciation "Pay It Forward"
Thomas H. Begnal, naturalized 23 Mar 1870, Albany, NY, emigrated from Meath Ireland via Liverpool, when is unknown. 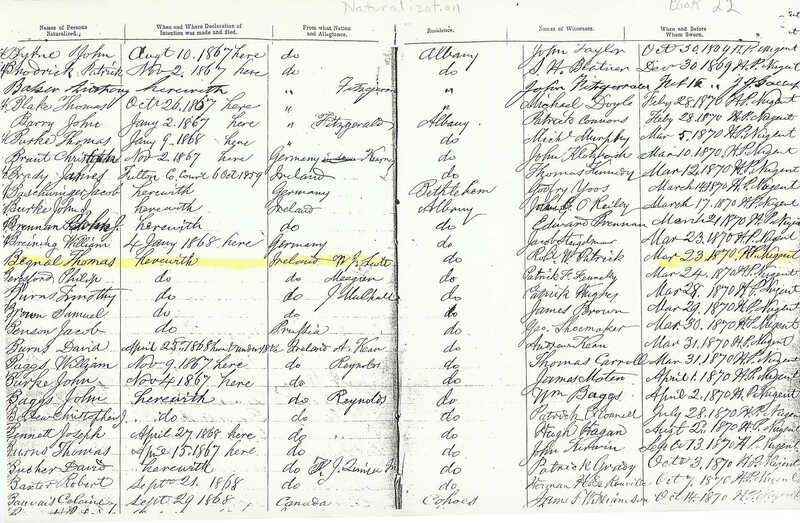 March 15, 1906 - passenger list of Thomas, a US Citizen, coming from Garadice, Co. Meath Ireland to home Saratoga Springs, NY. 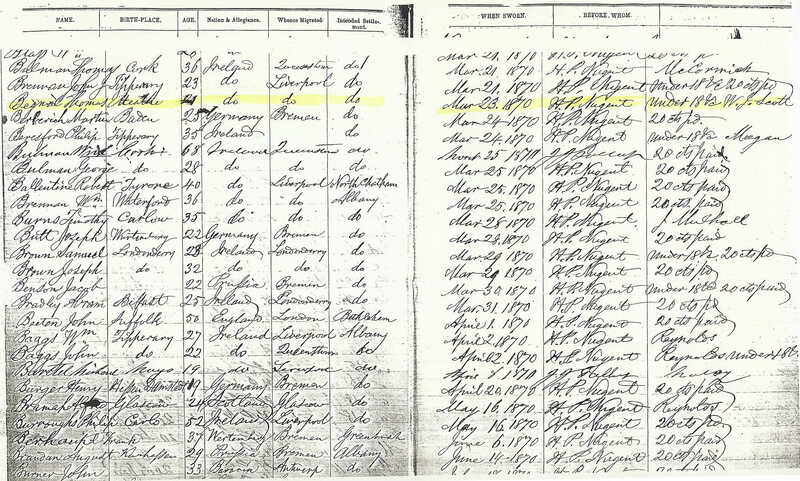 Garadice is in Meath Co. May have immigrated in 1860-1866. Unknown if George F. Begnal is the biological father of my Grandfather Clifford Franklin Begnal. George Felix Begnal, Not Biologically Connected Father of Clifford Franklin Begnal - NY Health Dept & Utica Vital Statistics Birth Not Found. Had been looking 24+ yrs as to who Clifford's real biological father is/was, and Clifford's full name at birth. (1) George Begnal 3rd. marriage to Edna M. Avery, 20 Jun 1921, Saratoga Springs, NY. 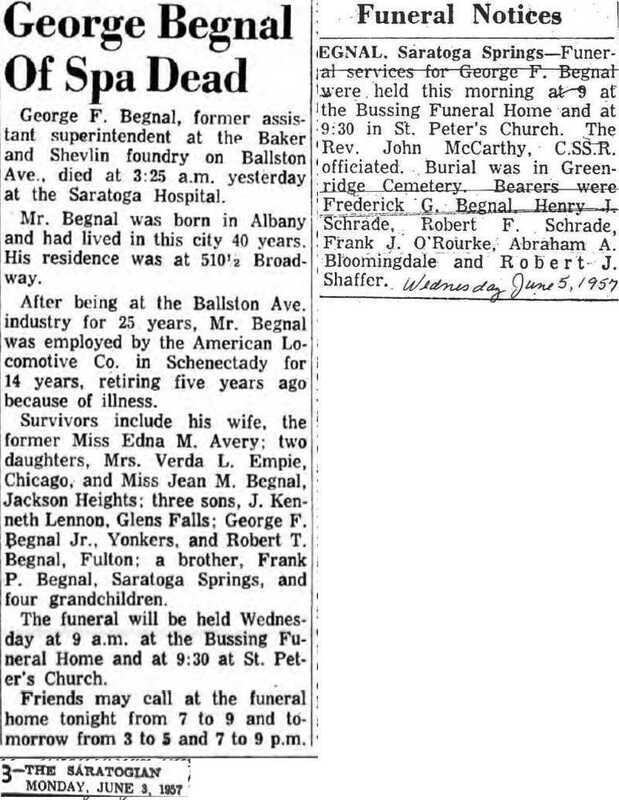 Children George F. Begnal Jr. 21 May 1921, d. 1978, Jean Mary Begnal, b. 1923, John Avery (Jack) Begnal, b. 1924 and Robert Thomas Begnal, b. 1931 (3). 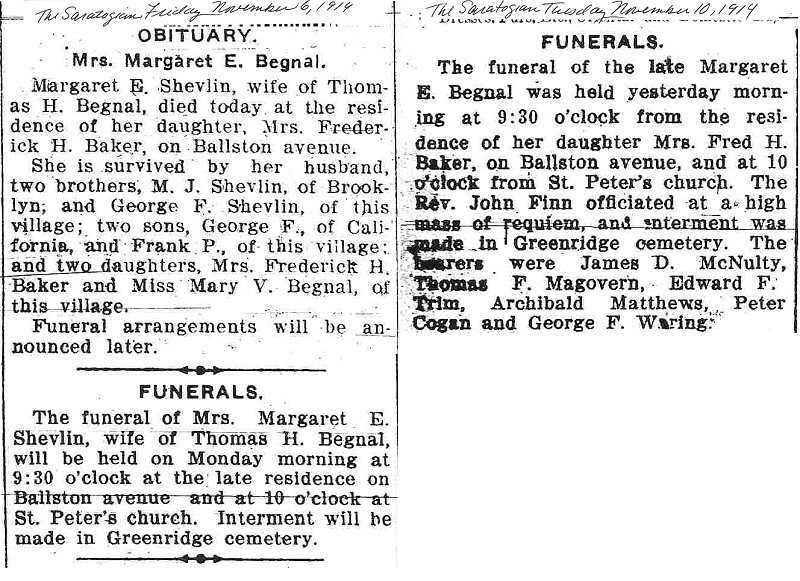 (3) Robert Thomas Begnal says his grandfather was Thomas Begnal (1847-1928), m. Margaret E. Shevlin (1851- 6 Nov 1914). 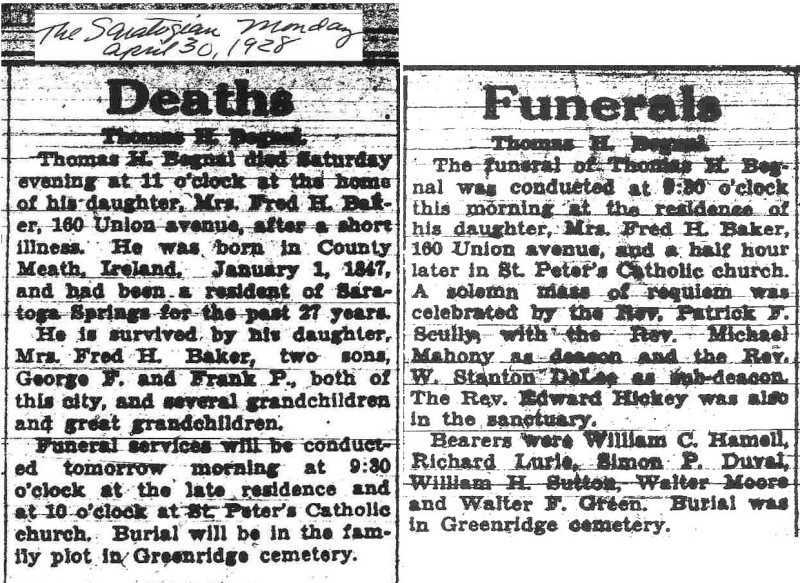 Children: George Felix Begnal (15 Feb 1879 - 2 Jun 1957), Frank Patrick Begnal, b. 4 Jun 1882, d. 17 Jul 1966, Katherine M. (Kate) Begnal, b. 12 Aug 1876, d. 23 May 1947, Mary V. Begnal, b. Feb 1887, d. 23 Feb 1920, and Katie Begnal, b. Jun 1890. Mary Begnal, b. abt. 1896. George Begnal, b. abt. 1902. Joseph Begnal, b. abt. 1903. Calista Begnal, b. abt. 1915. The following is some of which I have found on the internet in my quest to find the origin of my surname Begnal, searching records and I wish to share these surnames and links of those who have spent the time & research in putting together the following. Michael S. Begnal writes: Begnal, comes from the Gaelic name O'Beigleighinn, which also gives the surname Beglin, Beglan etc. (see The Surnames of Ireland by Edward MacLysaght ). It is easy to confuse these names due to the similarities and the many similar variants, but we must keep in mind that Beglin (Begnal) and Bagenal (Bagnall, etc.) are quite distinCT The former originally being a native and ancient Gaelic medical family, the latter arriving in the 16th century as part of the English security apparatus. MacLysaght is quite clear about this in his "More Irish Families". While the Bagenal's did eventually become Irish-ized, I think it is important to recognize the difference between the two surnames, which despite their similarities in orthography, are vastly different in origin and not at all related. Bagnall began around William the Conqueror's English invasion with variations like Bagenhall, Bagenal, de Bagenal, and settled in Staffordshire. In the 16th century Sir Nicholas Bagnall was sent by Queen Elizabeth, to head a constabulary in Ireland [Newry] and the Irish family grew from that.